3. Lodge hosts an informational session open to the general public. 4. 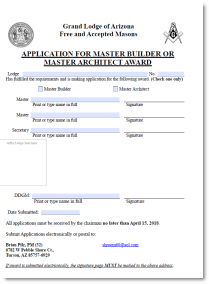 Lodge has a program to contact non-attending members, certified by DDGM. 5. 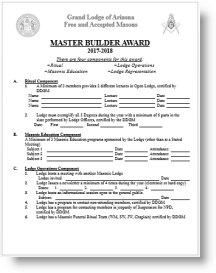 Lodge has a program for contacting members in jeopardy of Suspension for NPD, certified by DDGM. 6. Lodge has a Masonic Funeral Ritual Team (WM, SW, JW, Chaplain) certified by DDGM. 5. Lodge attends another Masonic Lodge meeting (stated or called) with a minimum of 5 members attending (2 must be the WM, SW, and/or JW). 6. Lodge Master Masons (a minimum of 2 non-Lodge Officers) attend a School of Instruction conducted by/under the auspices of the Grand Lecturer.